What a great summer we have had for cricket and this has meant that Boughton Cricket Club have played all of their eight planned fixtures with only one game ending in a draw due to inclement weather part way through. This was our annual fixture against Jesus College Cambridge which is always a wonderful day played on their beautiful ground in the centre of Cambridge. Boughton had worked their way into a winning position on the day before the heavens opened to curtail what would have been a thrilling finale to a great game. Overall Boughton have come out on top winning five of the eight fixtures with one drawn and two lost. There has been some fine individual performances with both bat and ball but overall the teamwork and the standard of cricket seems to improve with each season, with newcomers finding their feet easily in our friendly format of the game. After a very wet winter we finally had some spring like weather for our first home fixture on 18th May against Gooderstone. The wicket played extremely well with plenty of runs for the batsman but also a little for the bowlers and 80 overs resulted in more than 400 runs being scored on the day with a fine 90 N/O from James Webb supported by a breezy 26 from Steve Kornmuller securing a narrow win for Boughton. We also held a Chairman’s Invitational match in June whereby the Chairman held a BBQ and invited non-members from outside the club to form a barbarian’s side to challenge the regular Boughton XI. Boughton were the winners in the end but a fantastic day was had by all and the result being that the overall winner was the game of cricket as we got some non and ex-players involved both young and old and hopefully sparked their interest in coming back to the game. Further notable performances in the season include: a fine bowling performance by Owen Chandler (4 for 32) and the partnership between Ollie Short (65) and Barry Ovel (21) at home against FFF in August. Another thrilling finish in this match saw a last wicket stand between Chandler and Chairman Steve Short who won the game in the final over with the Chairman getting Boughton across the line with a fine straight drive which secured cries of ‘ooh’ from those lucky enough to witness it. Our final match of the season was played on Sunday 7th September at Gooderstone with Boughton taking the honours in a hard fought and competitive match. Once again a great team effort and notable performances from Webb and Captain, Wilkinson with both making half centuries with the bat after opener Conquest put down a solid foundation of 38. With the ball, Alfie Bowles and Jon Allen both excelled taking 5 wickets between them to grind the Gooderstone innings to a halt with the overs running out. Our last job for 2014 will be to prepare the ground and playing surface for the winter and investment now makes a huge difference to how well it plays the following summer. It will involve spreading fertiliser, grass seed and then a covering of approximately a tonne of loam just over the playing square in the centre of the ground, so not a small task in itself. The club continues to progress and after our investment in some great equipment in 2012 thanks to a grant from Sport England, the club has this summer invested its own funds in a portable net for practice and also submitted a planning application for a modest Pavilion for changing and preparing match teas and to act as a real home for the club. Final thanks go to the volunteers who have helped us run the club this year and in particular to David Cooper who has looked after the ground for us over the season and kept it looking in great shape throughout- it’s a real credit to his dedication and enthusiasm. The club will continue to progress and we remain a very open and friendly organisation always looking to increase participation in this wonderful game. You don’t have to live in Boughton or be a current player, all ages and abilities are catered for and all are welcomed including anyone who may wish to help out as a social member or volunteer. The club will help with coaching and encouragement and get you actively involved form the start. 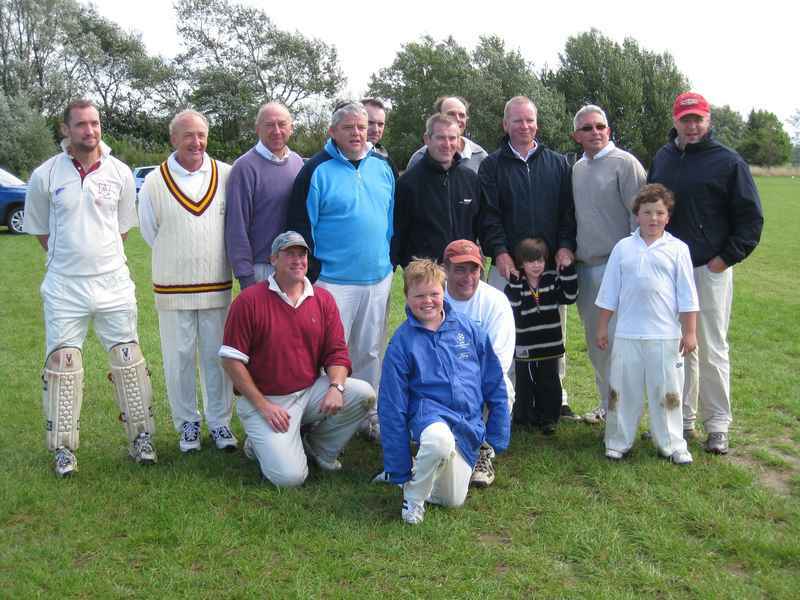 If you are interested in getting involved in some friendly Sunday cricket with a great bunch of friendly, like-minded individuals please contact Steve Short (Chairman) at theoldstablesboughton@btinternet.com or on 07768 807534. Please look out for updates on our progress over the winter and I look forward to seeing you at the ground and hopefully at the pavilion in 2015. Summer has arrived at last and Boughton Cricket Club’s season is now well under way with three fixtures now played. Our first fixture against Gooderstone was a home fixture played on a glorious afternoon and after posting a score of nearly 200 runs Gooderstone must have thought that they were in with a good chance of winning. However they had not counted on the indomitable James Webb who strode to the crease for Boughton with a number of wickets lost and the run rate getting away. James set to work and by the time the game was won he had amassed a score of 91 not out with a wonderful display of cricket strokes and determination. This is the highest score posted by a home player on our new pitch. It was a fantastically entertaining match and a great result for Boughton. Our next game was against East Rudham away and again in a lower scoring but equally close and entertaining battle, Boughton saw off the hosts to win again with Ollie Short this time making a very mature 56 and ensuring that Boughton got over the line to win. The most recent game was a club match with the chairman fielding an invitation side against a somewhat depleted Boughton side. Again we were blessed with splendid weather and in a over match the chairman’s XI came up a little short on the bowling side with Boughton making the 110 total required to win, fairly easily. After the main match a short over ‘blast’ was arranged in which Boughton made in their six overs and the chairman himself helping secure a victory for the invitational side in a last wicket stand. Once again a very entertaining day for all and good to see so many outsiders coming to play at our picturesque ground on open gardens day. In other news we have recently purchased a new mobile net for practice and will be arranging more regular net session for the rest of the season. We are also continuing to investigate the possibilities of a small changing facility and pavilion for the club. Our next home fixture is on 26th June and is an evening 6pm start T20 with should prove very entertaining to watch. After that it is Sunday 6th July 2pm and then Sunday 17th August 2pm. We would love to see you at any of these fixtures and if you fancy getting involved please call me on 07768 807534 or e-mail theoldstablesboughton@btinternet.com . You can also get more information on our new website www.boughtoncricketclub.co.uk . We would love to see you whatever your age or experience. In a moment of madness, Geoff Proctor accepted the challenge of providing a team of 11 cricket players from Boughton to play against the might of 2Agriculture. After some arm twisting Geoff managed to coerce 10 players from Boughton and young Bobby Barker (grandson of Frank and Sandy Reid). 2Agriculture batted first and posted a very competitive 109 in 20 overs. Contributed largely by opening batsman Brand Jnr who scored a commendable half century and then retired to allow his team mates to contribute to the innings. 2Agriculture Captain Brand Snr retired on 9 and in between Batsmen Harvey and Pothercary chalked up 12 and 14 respectively. Exiles Captain Ovel and Barker bowled fine containing spells. After a wonderful tea provided by the good ladies of Boughton, The Exiles set about their innings.The Grandfather and Grandson combination of Reid and Barker opened the batting for Boughton. It was not long before Grandfather had run out Grandson! Frank scored 12 valuable runs before retiring to make peace with Bobby! After the loss of 2 more wickets Emad George steadied the ship and, ably assisted by Faherty and Fisher the Boughton Exiles started to get to grips with the bowling culminating in a frantic run chase. Unfortunately, our efforts were in vain as we finished a few runs short. A splendid day was had by all, a game played in a fine spirit of sportsmanship in idyllic surroundings. Many thanks to all who contributed to the day, particularly Geoff for arranging the event, Gooderstone CC for allowing us use of their facilities and The Bedingfield Arms for the splendid post match sandwiches. A fine partnership of 90 runs between Ollie Short (54*) and Eliot Koopowitz (32)led Boughton to a thrilling victory – and their first piece of silverware – as the season approaches a close. Gooderstone batted first and their openers dug in against some tight bowling from Jenkins and (to a lesser extent!) Wilkinson; but Boughton did not find their first wicket until the 14th Over, when Ollie Short came into the attack with the score at 58-0, clean bowling the dangerous Sam Morgan. A fine spin bowling partnership developed after the drinks break, as James Webb and Eliot Koopowitz ran rampant through the Gooderstone middle order, claiming 4 wickets for 18 runs off 10 overs between them. Nevertheless, as the pressure mounted on Gooderstone at 89-5, their tail-enders came into play, playing risky shots which never seemed to go to hand. Although Gooderstone lost two more wickets in the process, they managed to add another 62 runs before the forty overs were up, leaving Boughton 152 to chase. This, on a dry pitch with variable bounce seemed a daunting task and Boughton knew they would have to bat well. Boughton’s hopes seemed dashed when the ever-reliable Hugh Jenkins was bowled for a duck on the third ball of the innings; he was followed five overs later by the in-form James Webb (7) and, at 24-2, Boughton looked to be in real trouble. Barry Ovel (10) and Eliot Koopowitz steadied the innings for a few overs, before Ovel was given out LBW to a straight one from Gooderstone’s second change bowler. The partnership between Short and Koopowitz that followed was extremely well-judged. For nearly 15 overs, they refused to take any risks, simply batting and becoming accustomed to the pitch. When they reached the 28th over – and had scored only half the required runs – both batsmen opened up. Ollie Short played two fine strokes – one slog-sweep over wide long on and a more classical cover drive; Koopowitz quickly joined the party with a couple of expertly placed paddle sweeps. Both looked so settled and in control that they looked likely to chase down the total between them, but on 127, Koopowitz was clean bowled by one that stayed a little low. Bartrum went to the crease and, first ball, was bowled by one that similarly kept low and before they knew it, Boughton were in trouble – requiring 25 runs off 40 balls. Phil Koopowitz soon made a dent in that total, smashing an enormous six and a four in quick succession, before taking a risky run and being run out. By then, the damage was done, however, as Boughton required only two runs off 15 balls. Steve Kornmuller, who was injured whilst fielding, came to the crease very bravely facing three balls, the last of which drifted wide, was missed by the keeper and Steve grabbed a quick bye taking Boughton over the line to a fantastic, well-deserved and deeply gratifying victory. Boughton Cricket Club’s season ended much as it had begun, with a well-earned victory on a windy day when rain threatened to disrupt the proceedings. BCC won the toss and opted to bat, hoping to build a large score and then restrict Geoff Proctor’s Invitational XI by bowling tightly. Alex Reardon and Eliot Koopowitz began cautiously on a pitch that offered seam and bounce. The loss of Koopowitz for 7 brought a new recruit, Chris Yates, to the crease and he made a good start, putting his foot down the wicket and cracking the ball through the off and on sides for a admirable 14 before being stumped. At number 4, Bernie Bartrum came in, but before facing a ball was run out after a mix up. BCC were looking unsteady, but Alex Reardon played a masterful innings for his 51 not out, whipping the ball over mid-wicket and long on for several fours before gallantly retiring. Supported by the ever extravagant Phil Koopowitz who put on 43 not out, they steadied the innings and with late flourishes from Owen Chandler (15) and vice-skipper Hugh Jenkins (15), Boughton accelerated to a massive total of 195 for 6. It looked a daunting total on a pitch that favoured the bowlers and Geoff Proctor’s Invitational XI made a restrained start to the accurate bowling of Mark Pogmore and Josh Reardon. Between them, they put the pressure on the opening batsmen and something had to give, Pogmore (5-2-4-7) taking a wicket in first over and two in his second and well-supported by the thrifty Reardon (7-0-18-1) at the other end. The loss of the first three wickets for just five runs brought Kevin Fisher to the crease, one of BCC’s own who had defected to the other side and who proceeded to bat excellently for his 27, leaving BCC with the distinct impression he has been training in secret! He was well-supported in the middle order by their opening bowler and a fifty partnership meant that Geoff Proctor’s Invitational XI were looking in good shape if they did not lose wickets. Sadly for them, quick wickets did fall to Wilkinson and Eliot Koopowitz. A mini fight back was led by their wicket-keeper (12) and Barry Ovel (another BCC renegade!) but the total was simply too great and, with further wickets to Koopowitz and Chandler, BCC wrapped up the game with four overs to spare. As the Club’s most successful year since its foundation with victory in three of our four games, this was a fitting end to a season that has been disrupted by torrential rain and waterlogged pitches. It is also fitting that one of our juniors, Alex Reardon should make a half-century and be named Man of the Match. With luck and good weather, BCC will be raring to go next season and we look forward to seeing lots of you then. Boughton Cricket Club welcomed an Eastern Daily Press Eleven for our first full match on our home ground, on Sunday 26th August, in glorious sunshine. Boughton were put into bat in this 20/20 contest and started steadily with Hugh Jenkins and Elliott Koopowitz at the crease. Both wickets were lost cheaply, leaving Philip Koopowitz to push the score along. He was joined by captain, Ben Wilkinson, who was soon bowled trying to score rapidly. This left Koopwitz (snr) to carry the team forward with some big hits, before being caught for 48. The next four wickets fell quickly. Steve Kornmuller had to retire injured after taking a quick single, leaving Boughton with only one wicket standing, this falling quickly after. Sportingly, the EDP team allowed young Theo Brown to take up Kornmuller’s innings and along with Mark Pogmore, they managed to squeeze a few more runs onto the score before running out of overs, leaving Boughton with a score of 88. The EDP started their innings strongly with big hitting boundaries but their early promise was ended with Ben Wilkinson bowling both openers, Brassett and Blackmore. This slowed the EDP team, as the Boughton bowling and fielding tightened their grip on the game, with Hugh Jenkins and Alex Reardon taking a wicket each. Only Setchell was able to keep pushing the score up but his innings was ended by Elliott Koopowitz taking another two wickets in his first over, tipping the balance firmly in Boughton’s favour. Elliott took two further wickets finishing with an excellent 5 wickets for just 7 runs. The EDP team had no answer to this with only a few more runs being added. The final wicket fell to Alfie Bowles in the 18th over, leaving the EDP with a total of 51 all out. 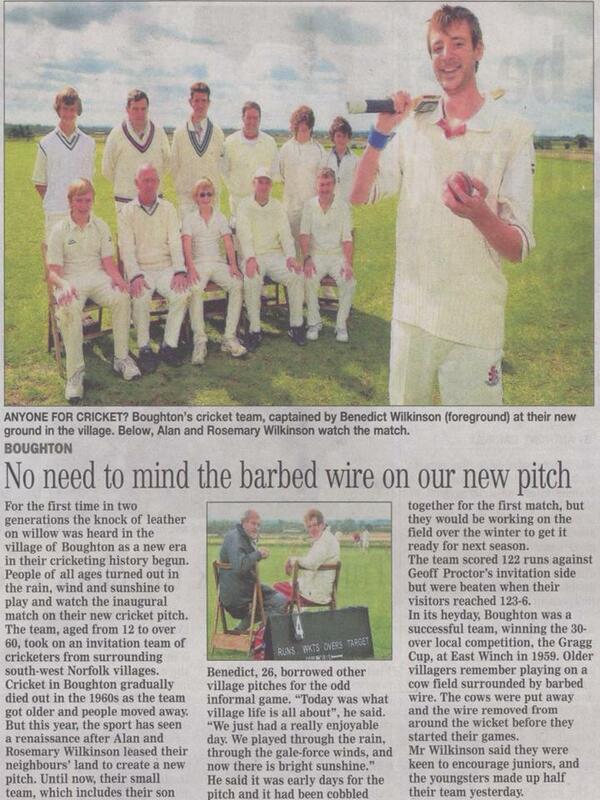 A good first effort for the Boughton team on their new pitch. In the excitement of the win on their home ground, nobody was awarded the man of the match, so I think I will slip in here and give a family award to Elliot and Philip Koopowitz for their excellent bowling and batting. Many thanks to everyone at BCCl who have cut and prepared the field, served tea and cakes and generally made things happen. Without you, none of this would have taken place. After tea, the Kwik Cricket kit appeared, with many of the youngsters enjoying a fast and noisy hour or so of fun, led by Philip, Elliott and Hugh. It was fortunate that the equipment was bright orange as the sun was setting when they finally finished. All in all, an excellent day at Boughton, with a tremendous turn out from spectators and supporters with the “grandstand” full. Boughton got its season under way successfully with a closely contested victory at neighbours Gooderstone, with opener Eliot Koopowitz carrying his bat through the innings with a match-winning 77 runs not out. It was great to start to the new season at Gooderstone’s pretty ground, well-supported by our loyal travelling band equipped with their heavy coats, blankets and umbrellas to watch the beautiful summer game! Given the deluge we have experienced in recent weeks, the Gooderstone wicket played very well for the batsmen, with a hint of seam movement available as help for the bowlers. The outfield was a little slow, only to be expected, but quite a number of boundaries were registered by both teams, keeping supporters around the ropes on their toes! Barry Ovel and Hugh Jenkins opened the bowling with typically accurate and tight spells, both collecting wickets from the Gooderstone top order. Ovel then turned to the ‘dark side’ as he donned pads and gloves to play the remainder of the match as wicket keeper (which he did splendidly!) Alex Reardon generated some nice pace during his spell, with a few nicely disguised ‘changeups’ thrown in to deceive the opposition. Koopowitz’s deadly twirlers accounted for 3 Gooderstone wickets,including the top-scoring S. Merritt, plus 10 and Jack to end the Gooderstone innings. The match was marked by a couple of standout catches from Boughton. First, Alex Reardon’s sharp diving catch at gully to dismiss Gooderstone opener M. Smith gave Boughton momentum at the beginning of the innings. Second, spectators had the treat of seeing Koopowitz take a catch off Pogmore’s bowling that is as good as you’ll see in any standard of cricket. Diving full-length to pouch a screaming shot from the dangerouslooking Bandy, it brought back memories of Jonty Rhodes in his pomp. Opening the batting for the first time for Boughton, Steve Short played a battling innings, occupying the crease with confidence and helping take the Boughton total to 31 runs before falling to Brookes for 4. Josh Reardon showed aggressive intent for his 10 runs, lifting the ball back over the bowler’s head on a number of occasions, with Jenkins contributing a couple of boundaries as Boughton edged closer to their winning total. New to the club this season are father and son dynamic-duo Colin and Theo Brown. Colin freely admitted, though he loves cricket, he had not hefted a bat since his schooldays. Despite that, he played a little cameo of an innings until his hamstring had other ideas, unfortunately forcing him to retire hurt on 6 runs. Some gentle stretching needed before the next match Colin! Son, Theo chipped in with a tidy debut bowling performance, opening up his account with a Maiden over, keeping the pressure on the Gooderstone middle order. Ben Wilkinson performed well as captain, making good bowling changes and providing constant encouragement to all players while out in the field. Ben also turned in a shortbut hostile spell of fast bowling, accounting for the wicket of Morgan nicely taken behind the furniture by Ovel. So, a great start to the season by Boughton with a great team performance. A tight bowling and fielding performance restricted Gooderstone, withKoopowitz’s anchoring innings bringingcontributions all the way down the order to help Boughton chase-down 148 runs for victory. Needless to say it was an exciting match, played in great spirit, with both teams fielding a balanced blend of seniors and juniors. Thanks again to our hosts Gooderstone, and we look forward to inviting them back to Boughton for a return match later in the season! Boughton C.C. – S. Short, E. Koopowitz, C. Brown, A. Bowles, J. Reardon, H. Jenkins, B. Wilkinson (Capt. ), B. Ovel, A. Reardon, M. Pogmore, T. Brown. Gooderstone played host to Boughton CC on Sunday 28th Aug in a friendly that did its best to duck the August showers and prosper during the sunny spells. Played at Gooderstone’s lovely ground–set inside a wooden-fenced boundary, surrounded by horse meadow with a couple of interested equine spectators throughout - Boughton came into the match hopeful for a win against a Gooderstone Sunday team that sported a similar mix of seniors and talented juniors (N.B. I’m not trying to say our seniors are without talent, you understand? We are all talented, in our special ways etc. etc....). The Gooderstone wicket provided an excellent surface for batting and bowling, offering true bounce and even pace. Certainly, a great standard for Boughton to aim for as we develop our own ground during the coming seasons! Winning the toss, Gooderstone elected to have a bat. Boughton started well, keeping things tight in the field with Alex Reardon and George Porter opening our bowling account with attention to good length and line. Porter removed the Gooderstone opener Merritt, followed by a string of wickets for E. Koopowitz with his mesmerising leg breaks. Another effective spell of left arm medium pace from Mark Pogmore accounted for middle order wickets, with Steve Short picking up another from his short spell of ‘doosras’ (that’s correct isn’t it Steve?). Gooderstone’s batting tail was about to wag however, with controlled aggression from Sayer (49) and Morgan (29) hitting 11 boundaries between them in a strong finish. Gooderstone ended with a tally of 135 for 7 from 40 overs, which represented a good recovery after it appeared for a long period that Boughton would be able to restrict their total to well under 100. After an excellent tea in the Gooderstone pavilion, giving our travelling supporters a break from the excitement to consume their picnics, Boughton donned their pads and strode into the sunshine for a bat. E. Koopowitz (24) and A. Reardon (21) dug-in with a strong partnership sprinkled with boundaries and some stylish play. Reardon was dismissed by a smart run-out, and Kooperwitzes E. & P. fell victim to a fine spell of seam bowling from young Mitchell Brooks, who also accounted for opener H. Jenkins. Continuing where he left off in Boughton’s last match, Al Roberts showed us some calculated batting, but found it hard to establish any lasting partnerships as Sayer (3 for 4) ripped through Boughton’s middle order. Unfortunately, during his innings Roberts fell ill and the match was called to a halt and subsequently abandoned after 29 overs, with Boughton on 74 for 7 wickets. I am pleased to say Al has made a good recovery, and has all of our best wishes. I also note that Al finished not-out (again) which puts him at the top of the batting averages for the season! Our thanks go to Gooderstone for hosting us at their splendid venue, and for a competitive match. We look forward to continuing the fixture next season, and hopefully to bring them across to Boughton to reciprocate. Thanks also to our loyal supporters (Boughton Barmy Army) who cheered us on throughout. 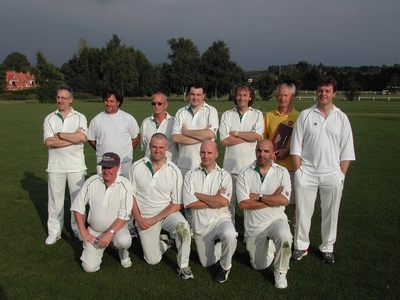 Boughton CC: H. Jenkins (Capt), P. Kooperwitz, E.Kooperwitz, A. Reardon, A. Roberts (Wkt), S. Short, M. Pogmore, K. Fisher, G. Porter, A. Bowles, J. Allen. This week Boughton CC travelled across the Fens for a new fixture with Welney, breeding ground not only for rare Swans, but also fast-bowlers it seems. 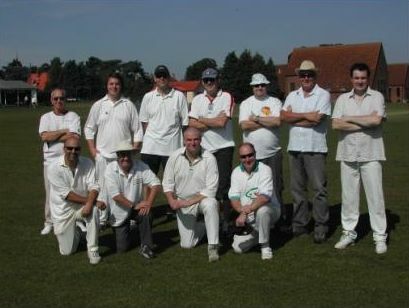 On a gorgeous day for cricket, Boughton team and supporters gathered at Welney’s pleasant ground, and losing the toss, were sent into the field for a bowl. The match marked a Boughton return for some familiar faces – Ben Wilkinson, taking a break from work and blogging in the Middle East, father and son cricketing duo Phil and Eliot Koopowitz, and our all-American big-hitter Steve Kornmuller, happily back to match fitness. Boughton got off to a brilliant start thanks to some sharp fielding by Sam Fearn at mid-off. Gathering a full-blooded drive in a flash, Sam had their opener run out by yards in the very first over. This was followed by quick wickets for Ollie Short and H. Jenkins that kept the pressure on Welney. A superb spell of 8 overs of accurate spin from Eliot Koopowitz brought 3 wickets for 21 runs, with Koopowitz Snr chipping-in with a fine diving catch at point, and Eliot himself pouching a fizzer off his own bowling. Ben Wilkinson was straight back on song with his aggressive and accurate pace, removing two Welney batsmen in his first over! Ben you must have been practicing with some beach cricket during your desert travels? Olly Short and J. Reardon duly mopped up the tail with a wicket apiece. Boughton yet again showed what they can do, with accurate bowling and excellent fielding limiting a strong Welney batting line up to 108 runs, taking all 10 wickets inside 27 overs. Also worthy of special mention was Al Roberts behind the stumps. A top-notch performance saw Al diving, catching, and motivating throughout the innings. Real ‘body on the line’ stuff! Recognition also for a fine innings of 34 runs from J. Loveday, Welney’s captain. After an excellent tea, Boughton commenced their innings and were immediately faced by a pair of formidable ‘Quicks’ in Welney’s Saberton and Dale. The two pace men blew through Boughton’s top order sharing 7 wickets at a cost of only 14 runs off 10 overs! Some resistance was offered by Wilkinson, scoring 7 before being bowled by a ‘Jaffa’. Boughton also played a nice rearguard action with some lusty hitting by Pogmore (“..that’s the furthest I’ve ever hit it!”) and handy runs from Ben Hall. Batsman of the day for Boughton was Al Roberts, topscoring with a stylish 15 and carrying his bat. Unfortunately, Boughton were undone by fine pace bowling from the Welney opening duo, finishing 40 all out inside 14 overs. Well done Welney and we look forward to the return fixture next year! Congratulations to Alex Reardon for his umpiring; his unerringly good judgement and cool head under pressure – who needs DRS anyway? Thanks also must go to Boughton’s own ‘Barmy Army’ of travelling supporters, who cheered us on through thick and thin! Finally, thanks to Steve and Karen Short for hosting drinks and a get-together back at Boughton after the match. It was great to replay the day’s events over a cold beer, and talk through the almosts and might-have-beens of an enjoyable day. We have built a fantastic team spirit at the club which extends across players, members and our supporters. If you fancy getting involved and having some fun with us, then do come and visit at our next game vs. Gooderstone on Sun 28th August. You’ll be very welcome! Boughton Man of the Match Award: Al Roberts, for a great all-rounders’ performance – first with the gloves and then top-scoring. 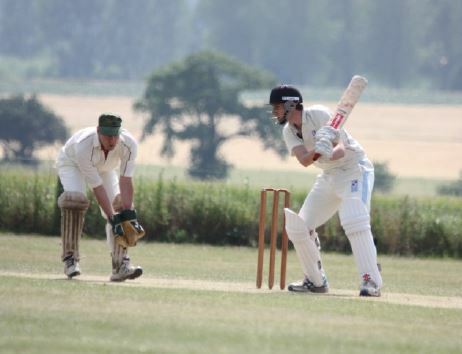 On June 5th Methwold played kind hosts to Boughton for their annual cricket fixture, with Boughton attempting to reverse two straight losses to Methwold last season. This was one of the classic ‘games of two halves’ for Boughton. Starting in the field, we couldn’t have wished for a better performance, with Boughton always on top. From literally the very first ball we applied pressure – Hall taking a good catch at gully off a rising ball from A. Reardon. The theme of great catching continued throughout the innings with Baron, Jenkins (2), Allen, and J. Reardon all holding onto sharp chances. The attitude in the field was exemplary and Boughton probably saved themselves 30 runs with some fine fielding. Boughton’s bowling was also up to the mark, with standout spells from A. Reardon taking 2 wkts for 9 off 5 overs, Short with 2 wkts for 20 off 5 overs, and Jenkins returning a ‘hat trick’ in his final over. Tight spells were also turned in from Pogmore with some tidy ‘left arm over’ medium pace, and from J. Reardon always probing the corridor of uncertainty; both taking one wicket apiece. Methwold set Boughton a score of 112 to win. Boughton’s innings got off to shaky start with openers Jenkins and Baron dismissed cheaply, despite looking confident for the first few overs. The top order was shored up with solid performances from A. Reardon, hitting a brisk and breezy 26, accompanied by a determined effort of 19 from Roberts before holing out to one that popped off the surface. Unfortunately, no other batsmen made it into double figures and Boughton ended 75 all out. We came up a little short with the bat this time, with more practice needed from all in this department. Bring on the nets! Nevertheless, still a very pleasing performance by Boughton. Especially so given two thirds of the team comprised Junior players. We have some fine cricketing talent coming through the ranks at Boughton CC that will hopefully set us in good stead for seasons to come. Some of the ‘crusties’ aren’t too bad either J! Thanks to Methwold for a game played in great spirit and their fantastic hospitality at the Social Club following the match – our turn next season, hopefully! Thanks to Dawn and Debbie for their hard work in making the fixture happen. And a final thanks to Steve Short & Jon Allen for their just and meticulous umpiring on the day – henceforth they shall be known as Hawkeye and Snicko. Boughton Man of the Match award: Alex Reardon, for a fine performance with bat and ball. Boughton Team: Hugh Jenkins (Capt), Gerard Baron, Alex Reardon, Al Roberts (Wkt), A. Bowles, Ollie Short, G. Porter, Josh Reardon, J. Allen, Mark Pogmore, Ben Hall. Many thanks to all who played , helped and attended on this wet and windy afternoon supporting Boughton CC on their first match on home soil. Geoff and his team put up an outstanding performance whilst fielding – refusing to halt play despite the driving rain and hail stones. (mad farmers!). Boughton’s young cricket team put up an outstanding performance however were pipped to the post (watch out next year, Geoff). For the first time in nearly forty years Boughton fielded a cricket team in their match on Sunday 10th September against local rivals Beachamwell at Mundford Cricket Club. Ralph Proctor and his wife Ann were very welcome spectators, Ralph having played for the village for many years and is in fact the oldest surviving member of the 1960’s vintage. The team then played on Ralph’s father’s land on what is known as the Buildings Field in Mill Hill Road. On match days the playing area was cleared of cattle and fenced off, today cattle still happily graze on the field. Prior to that the team played on land now belonging to Park House. In those days teas were served after the match in the White Horse public house, with cups of tea made with milk kindly provided by Ralph’s father’s cows! One of Ralph’s overriding memories was of a young David Cooper who on hearing the team playing away had clinched a historic victory in the Gayton and District League decided to jump on his cycle and spread the news to the village, however he didn’t get too far before his progress was halted by an inconsiderate motor car! Back to the present day, Boughton were lucky enough to have 11 willing victims to take the field; what the team lacked in skill and fitness they made up for in enthusiasm. Unfortunately Beachamwell could only muster 3 players, however they were supplemented by 2 players from Mundford, 2 from Wereham and Peter and Ollie from Boughton who very kindly volunteered to play for the opposition, so a nine aside game could take place, comprising of 2 twenty over innings per side. Beachamwell batted first and made a very respectable 124 runs; in reply Boughton scored 98. Following a substantial tea Boughton returned to the pitch with renewed spirit (in more ways than one!) and were able to restrict Beachamwell to 94 leaving Boughton 120 to secure victory, a valiant effort was made with Boughton falling a few runs short. The performance of the Boughton team was excellent. Particular mention must go to Barry and Frank who bowled with the guile of Laker and Lock, to Hugh for some aggressive stroke play, to Emad who had a superb game behind the stumps and to Kevin who fielded for all four innings. A big thank you to all who contributed to a successful day, particular thanks must go to Phillip, Elliot, Patrick and Alex for stepping in at such short notice. The game was played in a good spirit by two competitive teams who provided a good afternoon’s entertainment for the spectators. Back row left to right - Herbie White, Alan Hearn, Joe Herod, Tony Wink, Roy Sherwood, Angus McIntosh, Bob McIntosh (brothers) and Dusty Miller. 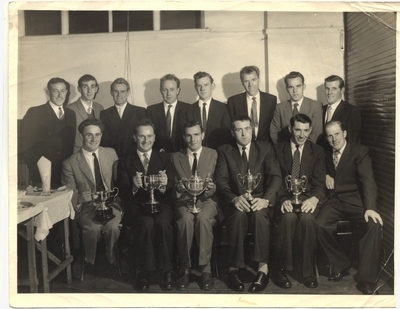 The photograph was taken in Downham Market Town Hall as the Boughton Cricket Club attended the awards dinner for that season. 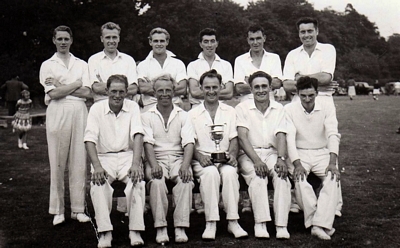 Back row left to right - Sid Chase, Angus McIntosh, Joe Herod, M Gooderson, J Mann, Mervyn Bruce. Front Row left to right - Wally Marriot, W Hatton, Rocky Bruce, John Glover, T Brown. Incidentally, our government has extended Gift Aid relief to apply to all Church Collections, provided individuals donate no more than £20 at a time and in cash! This will be a big help for struggling Parochial Church Councils. After the disappointment of our first match of the season in May at Gooderstone being abandoned due to rain Boughton got into winning ways with a tremendous fight back to win at East Rudham. A great stand by Phil Koopovitz and James Webb brought Boughton back from the brink to secure a famous victory. We have since played two more matches on our home ground, one an evening T20 against Stow CC which ended with Stow triumphant in fading light and the other on Sunday 7th July against a Nomad side from Chatteris area. Unfortunately Boughton were also unsuccessful and a little unlucky on the occasion but it was a beautiful day and well supported by visiting spectators and a ‘home crowd’. Our fixture list for the rest of the summer is set out below and anyone wanting to come and watch and support would be most welcome to any of the fixtures whether at home or away. I hope to see you over the season and let’s hope the good cricket weather in 2013 continues and we continue to have a successful season at Boughton Cricket Club. March 30th 2013 - Boughton Cricket Club – Scary Bikers!! Day 1 was from Hambledon to Guildford with early morning trains being caught from Norfolk for a lunchtime meet up in Hampshire (a pub was decided to be the best place from which to start). This proved to be a long hard day with approx. 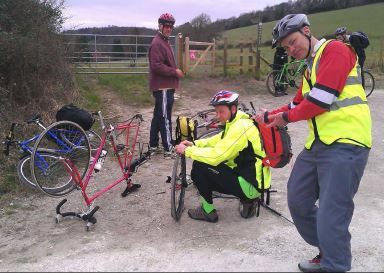 50miles to complete in a relatively short period of time with the scaling of the South Downs included. The bikers arrived in Guildford at approx. 8pm in the dark last night after suffering a couple ofpunctures on the way and whilst in high spirits for having completed the day were very fatigued and in desperate need of food and drink. 1st April - Hi Everyone – We’re Home!! Finally my sincere thanks to Jon Allen for organising this great event- we will be thanking him again over the season I’m sure for his efforts as we enjoy the benefits and success of the club. Jon has put in an enormous amount of time and effort into making this event the success it has been and he should be commended by everyone for this- Thanks Jon- I would also like to thank the other riders, some of who joined in for various legs and in particular to Jon, James, Kevin and Malcolm who ‘went all the way’ and who in fact I believe clocked up 237miles since Friday morning. Lastly my thanks to you all for reading this and offering both moral and financial support along the way it has all been hugely appreciated- I will be in contact with all you generous ‘pledgers’ over the next few days so that we can arrange to collect your kind offerings and if you were waiting to pledge but not convinced we could do it, I will still take any last minute offerings (last plug I promise) I have attached a few pictures for your entertainment and if anyone tells you that you can’t do something you probably can but probably shouldn’t!!!!!!!!!!! Thanks for your support. 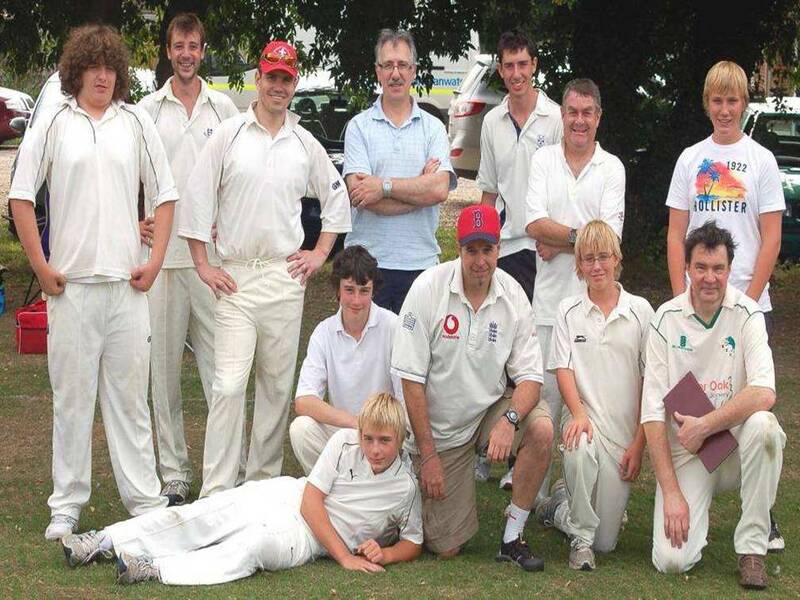 July 2012 - Boughton Cricket Club – Great News!! If you are a regular reader of this magazine I am sure you will have seen from time to time our splendid match reports written by Hugh Jenkins and other news about our fundraising efforts. You may not know, and if not it gives me great pleasure to inform you, that the Cricket club has just been awarded a grant of £9994.00 from Sport England to develop the club and its membership. Sport England is an organisation responsible for the fair distribution of funds raised from the national lottery to encourage more people to participate in sporting activities in England. 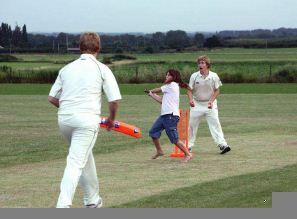 The cricket club had decided after last season that there was enough interest in the club and in the village and surrounding areas to try to push it forward and to transform our newly acquired field into a cricket pitch capable of holding a number of matches over the season that could be played in a safe and fairly contested manner. In order to do this we decided that a number of specialist pieces of equipment would be required, not least a heavy roller and high capacity outfield mower. This would involve spending sums running into the thousands which clearly would not be feasible to raise by normal fundraising events as well as looking after the normal expenditure involved in the running of the club. A capital injection would be required and so last Autumn Karen Short in her capacity as head of fundraising for the club, volunteered to begin the process of investigating grants that may be available. She came up with the Sport England option which seemed to fit our requirements nicely being available up to a maximum of £10000. Having secured the services of some of the more prominent names involved in Norfolk cricket circles Karen and I began the onerous task of completing the online application which ran to many pages with huge amounts of information being required and justifications written. Karen had been successful before in this type of task before, namely the grant which she secured for the playground equipment a few years ago and so always remained optimistic. I on the over hand, did have a few moments of frustration and thoughts of throwing the towel in. Anyway we finally completed the process in February and were told it would take up to 10 weeks to process the application. Sure enough in the eleventh week an email arrived but with no decision only a confirmation that the application was being looked at and a request for even more clarification. This was duly provided and then finally on the 18th June a large white envelope arrived at The Old Stables with the Sport England logo plastered all over it. With trepidation I opened it and was absolutely delighted to read that our application had indeed been successful and we were going to get the full amount requested of £9994. We are now waiting for the funds to arrive into our bank account and this will then enable us to get the roller, mower, a cover for the pitch and a site screen. These items will now allow us to move forward with the development of the club and this is something which we need to do now in order to adhere to the terms of the funding as, if you remember, the remit of Sport England is to encourage more participation in sport by supporting causes and clubs which are able to deliver this. I would now like to take this opportunity to invite any of you, young or old, who used to play or had ever thought they may like to learn to play the game of cricket or to become involved in the social side of the club to contact us. The club is most definitely open to all and is a friendly safe environment for all to enjoy. I thought my days of playing cricket were numbered until last year when I was encouraged to get involved again and have thoroughly enjoyed all the games I have been involved in. You can get in touch by speaking to any member or contacting Dawn Reardon on 01366 500853 or email reardons@stillandstar.co.uk . Dawn will be able to give you all the information you need to get involved. As a footnote, I have to say that although this grant application was a very long drawn out and detailed process we were successful in the end and I am pleased to think that our lottery money maybe does eventually end up in the right place and the powers that be maybe do come up with the right decisions sometimes – it’s up to us now to make it all happen so please don’t be shy and get involved. We have now completed the main part of the work on the cricket square – we had a little more mechanical help than was anticipated and with Dale Watson and his very professional and passionate team, the work was done in the space of about 3 hours and to a great standard. We just have to wait for some rain now to get the new grass growing and by next summer we should have a very usable and safe surface to play on which should only improve over the coming seasons if we look after it. 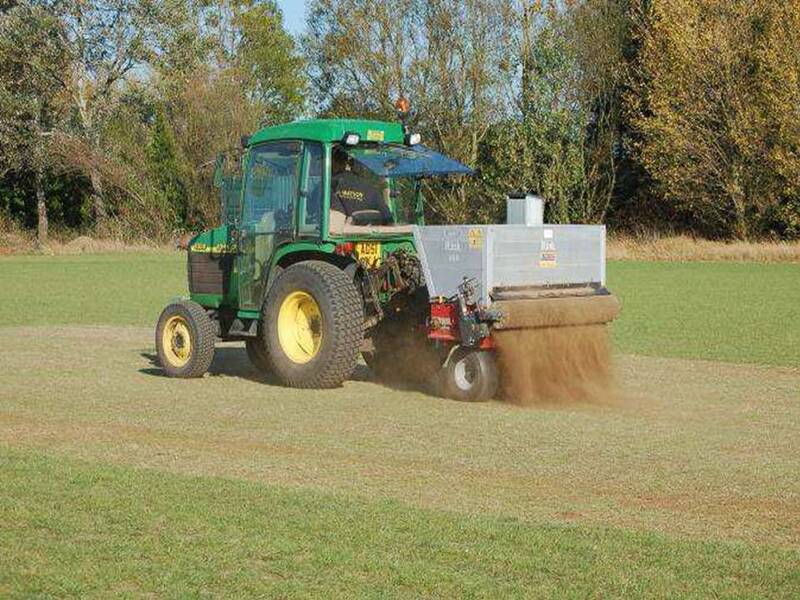 As regards the outfield, we have made the decision to postpone the re-seeding of this until the spring as it is too dry at the moment and is likely to be too late to sow the grass by the time it gets wet enough for the seeder to work properly. Thanks to all those volunteers who turned up and fortunately didn’t have to expend much energy in the end. It was great to see the support and for everyone to see the finished article after Dale and his team had worked his magic. Thanks again for your help and support. Boughton Cricket Club now has a home, after an overwhelming YES at the DCB Planning Meeting of Monday 6th June, we were given full planning permission for change of use for the field in Wretton Rd, kindly donated for use by Alan & Rosemary Wilkinson, to be changed to a cricket pitch. We would like to thank all those that have worked hard to help make this happen, especially Tim Madgewick and Frank Reid. Also a big thank you to the rest of the committee, members and friends of the club who have been very supportive throughout. We can now start to prepare the pitch for next season so we can host home games. Barry Ovel has been working hard on the field over the past few months transforming it from a farmed field to what is now starting to look like a cricket field, he is doing a fantastic job and we would like to thank him. To help Barry we will be having a Stone Picking afternoon on Sunday 26th June at 2pm to clear the last of the stones from the pitch, with a prize for the most stones picked, so if you can, do please come along and if you ask those that helped last year, it is quite fun!! We will be arranging some Fundraising events over the coming months, to raise funds for the progressive works on the field, so please watch out for those as we need all the help and support we can get to make this a success for all to use not only for Boughton but the surrounding villages also. Although we have not had a home we still have been busy playing Cricket games over the last couple of months. So far we have played at East Rudham and Methwold with a couple more to play, finishing with the Farmers match on our own field at the end of the season, so watch this space for details of that!! So if you fancy playing a game of village cricket or want to help come and join us, juniors and seniors, all are welcome.